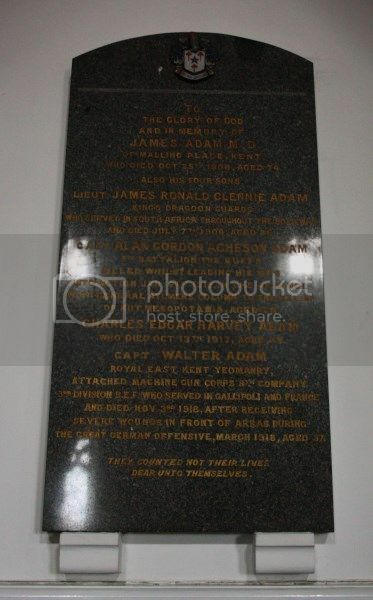 To the glory of God and in memory of James Adam M. D. of Malling Place, Kent, who died October 25th 1908, aged 74. Lieutenant James Ronald Glennie Adam, King’s Dragoon Guards who served in South Africa throughout the Boer War and died July 7th 1906, aged 25. Captain Alan Gordon Acheson Adam 5th Battalion the Buffs killed whilst leading his men into action January 21st 1916, in the advance with General Aylmers Column to the relief of Kut, Mesopotamia, aged 28. Charles Edgar Harvey Adam who died October 13th 1917, aged 33. Captain Walter Adam Royal East Kent Yeomanry, Attached Machine Gun Corps 8th Company 3rd Division B.E.F. who served in Gallipoli and France and died November 3rd 1918, after receiving severe wounds in front of Arrus during the great German offensive, March 1918, aged 37.